This was in recognition of his hard work and innovation in establishing a new weekly physical activity session at the Share Garden, situated in Springfield Hospital, Tooting. The session is open to people accessing Share’s community services and is designed to help them build regular exercise into their lives. Participants enjoy a range of different indoor and outdoor activities including Cricket, Tennis, Athletics, Boccia and Table Tennis. Omar has received lots of praise for his coaching and at the end of one session, a participant was moved to say, “I liked everything, he is my best coach”. 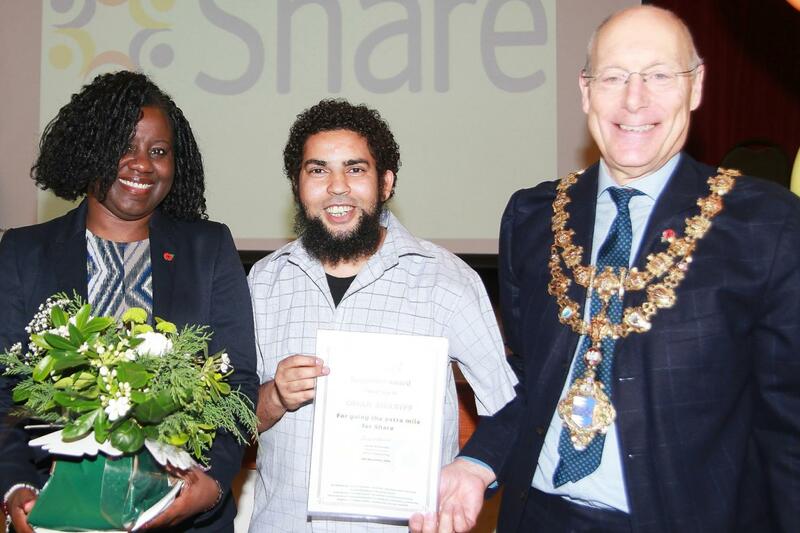 On receiving the award Omar commented, “I enjoy going to Share Garden because the venue is totally different from the sports clubs I go to. I can do my sports at a venue with good scenery and use the space at the garden to do my activity. Also the support I get from the staff at Share Garden really makes my coaching enjoyable, especially when they also take part in my sessions”. For more information on our coaching services, contact Hugh Elsegood, Sport & Physical Activity Manager on 07772 677259 or email hugh@disabilitysportscoach.co.uk.